HA NOI (VNS) — A solid waste treatment plant was launched in Ly Son Island in the central Quang Ngai Province three months ago to control environment pollution in the area. However, local residents still discharge domestic waste directly into the environment because the VND30-billion (US$1.4 million) plant can burn only about 1.2 tonnes of solid waste daily, just 10 per cent of its designed capacity. Solid waste piling up in heaps on land or floating in the sea threatens the lives of residents living along the 7km sea wall that runs around the island from Tay Hamlet in Vinh Commune to Dong hamlet in An Hai Commune. There is a similar situation at the 2ha plant where waste has piled up like a mountain, extending from the plant's entrance to the incinerators. Workers have to separate waste by hand and carry it to the incinerators using a few trolleys. 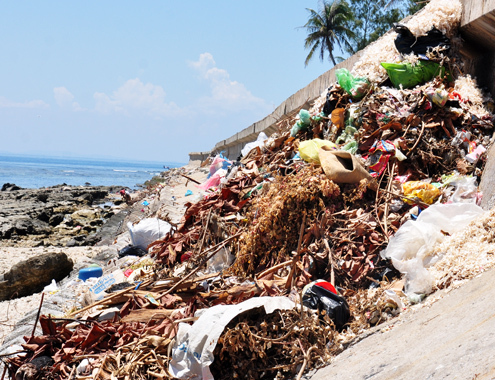 The island is flooded with solid waste everywhere due to the ineffective operation of the plant," An Vinh People's Committee Council Vice-Chairman Phan Thi Loi said. "Despite having a capacity to burn 12 tonnes of solid waste daily, it burns just 1.2 tonnes. Workers even have to carry waste to a temporary waste ground in the commune to burn it," Loi said. Deputy head of the plant's waste management department Vo Phuong Thach said the plant currently collected solid waste from An Vinh Commune, one of the island district's three communes. That's why in some residential areas, the local people still discharge waste into the sea, causing environment pollution. Quang Ngai People's Committee Vice-Chairman Pham Truong Tho said the plant was still being operated on a trial basis that revealed several shortcomings such as solid waste not being separated by households and the incinerator not being able to meet the demand as the amount of waste was increasing rapidly, compared with the period when it was designed. Tho said the province would ask the environment department of the natural resource and environment ministry to invest in more incinerators and facilities to reduce the number of manual wokers and increase the capacity of burning of waste.